Happy Boxing Day! Today is a bonus day for our Advent Calendar and last call for donations! DAY 26: Mr. K. Several thanksgiving holidays ago, I loaded up the JUNOTRK in LA with several wonderful dogs. Mr. Kunik is one of them - He was living in a big transport yard under a truck. FILTHY and STINKY and scared. not even remotely socialized but now!!! Look at how beautiful he is.adored and loved with his wonderful humans. Thanks to everyone who helped in that transport. and Huge thanks to his mom and dad who spoil him rotten. 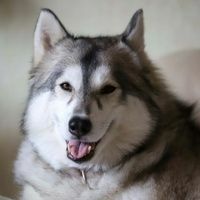 As the number of abandoned huskies continue to soar to unprecedented levels, we will strive to save as many as possible from the shelters in the coming years, but we will need your continued support to help us succeed. We cannot emphasize how important foster homes are, not only for the dogs to have a home environment which makes them more adoptable, but also it helps reduce our overhead kenneling cost which is very high. With your support, NorSled will continue to save dogs for the next 20 years! THANK YOU! Join NorSled as we count down to Christmas!